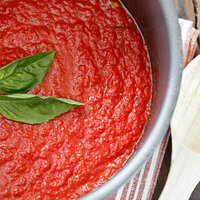 This is a great marinara recipe made from garden fresh tomatoes. Since I don't have those year around I adapted a recipe found with home preserved tomatoes. This is fast, flavorful and my go to tomato sauce for pasta and mozzarella sticks. In a large saucepan, sauté onion and garlic in oil. Add the tomatoes, tomato paste, water, sugar, salt, oregano, basil and bay leaf. Bring to a boil. Reduce heat; simmer, covered, for 20 minutes. Remove bay leaf from sauce; set aside. Remove sauce from heat and use a hand blender to puree sauce. Return to stove, add bay leaf and bring to a boil, simmer until thickened. Remove bay leaf and serve with favorite pasta. Yield: 2 1/2 - 3 Cups. I like this one. I like the ingredients you used.